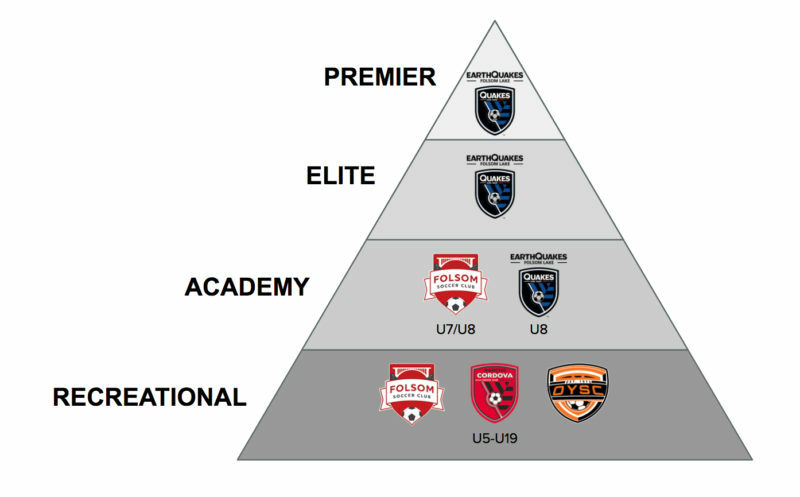 The Academy program is a transitional program that helps players foster development while moving from a recreational program to a competitive program. These teams are formed based on participation at either a Spring or Summer Academy session and typically play up an age group within the recreational leagues to offer the players a bit more competition. Within the Folsom Lake Soccer League, Folsom Soccer Club, Rancho Cordova Soccer Club and Orangevale Youth Soccer Club offer basic soccer programs for players anywhere from age 4 to age 19. The focus on this program is kids having fun playing soccer with their friends. Our programs try to keep the teams intact as much as possible over the years. Folsom Soccer Club also runs a TOPSoccer program. TOPSoccer is a community-based play, training and team placement program for young athletes with special needs (abilities). The program targets those kids ages 4 and up who would like to play soccer, but are challenged by the traditional soccer environment, including those kids with physical supports and wheelchairs.